We’ve all been there – angry, frustrated, hurt or misunderstood – trying to communicate a concern or issue to our partners only to find the discussion gets so far off track and escalates to a point that we aren’t even sure we know how we got there. It’s crazy, right? John Gottman, a leading researcher in the field of marriage and family therapy conducted numerous studies on how couples fight and the results were quite astonishing. Gottman’s research produced results that suggested 69% of marital conflict isn’t resolvable – no, that wasn’t a typo. 69% of conflict was found to be perpetual conflict based on personality differences. This doesn’t mean all of our relationships are doomed but it does further lend evidence to the idea that it is not what we are fighting about that is so crucial but rather the way we navigate the conflict. Can we listen, understand and respect our partner’s feelings, thoughts and needs even if we don’t agree with them? That’s the goal. 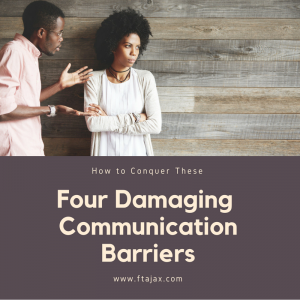 Gottman identified four damaging communication barriers and their antidotes, aptly named The Four Horseman of the Apocalypse. “I’m really angry that you didn’t sweep the kitchen floor last night. We agreed we would take turns doing it” is a complaint – it focuses on a specific behavior. “Why are you so forgetful? I hate to always sweep the kitchen when it’s your turn. You just don’t care” is a criticism. Criticism throws in blame and character assassination. Usually a harsh startup comes in the guise of criticism. Instead use gentle start up. Approach your partner gently – express your feeling and your need without attacking or criticizing. Try to give your partner the benefit of the doubt. Defensiveness is dangerous because it almost always escalates conflict. Criticism, contempt and defensiveness don’t occur in order, they feed off one another and can switch from one to the other and back again. Instead, take responsibility. Listen for anything your partner says that you can agree with or that is a good point. They might say, “You are always late.” You instinct will to be to defend by telling your partner all the times you weren’t late and all the times they were late or disrespectful continuing to escalate the situation. A healthier response might be, “You’re right, today I was late and I’m sorry for that. That wasn’t very considerate of me.” You aren’t fully agreeing with what they are saying but you are taking ownership of your part instead of arguing the details. Sarcasm and cynicism are both types of contempt. Name-calling, eye-rolling, sneering, mockery and passive aggressive or hostile humor are also types of contempt. Contempt is the most poisonous of the four horsemen because it communicates disgust with your partner. Contempt leads to more hurt and conflict. Contempt is often fueled by negative thoughts about your partner – you may be having these thoughts if there is unresolved conflict in the relationship. Instead describe your own feeling and needs. Try to share with your partner how you feel and what you need from them to make things better – this helps to resolve some of those negative thoughts and feelings. When criticism, contempt and/or defensiveness are present eventually one partner will tune out or walk away – this is stonewalling. When someone feels so overwhelmed with negative emotions they shut down instead of continuing the discussion. Rather than confronting, some are more comfortable disengaging because the idea of conflict or criticism, contempt and defensiveness are overwhelming. The person who is stonewalling acts as though they don’t care about what their partner is saying, if they even hear them at all. When people shut down, they leave their partner hanging in conflict. Typically, the conflict will remain unresolved and the cycle will start again. Instead, practice self-soothing. Practice staying in the moment. Use deep breathing or count to 10. It’s okay to tell your partner you are feeling overwhelmed and take a break, just make sure you communicate to them that you are not permanently walking away from the discussion, i.e. “I’m feeling really hurt and I need to take some time to process and calm down. Would it be okay if we talked about this in an hour (in the morning, tomorrow, etc.)? Fighting with your partner or spouse can be exhausting, disheartening and frustrating. Years of research suggest being aware of these common pitfalls and using the tips above to better manage your responses can drastically change how couples communicate. If you find that you and your partner are still struggling with effectively communicating or “fighting fair” we specialize in helping couples improve their communication even in times of conflict and we’d love to help. Book an appointment today. You might be surprised at how quickly we can help you get things back on track.